Their web page is also considered to be one of the most user-friendly sites among the online sportsbook entities and has a real time feel to it. They operate in the same manner when it comes to bonus and promotional offers. Sports Interaction is constantly willing to try new things to keep their customer base happy. Based in Canada and licenced by the Kahnawake Gaming Commission, Sports Interaction, known as SIA by most players, is operated by people experienced in the gaming industry and has offered an online sportsbook operation since 1997. Sign up bonuses at Sports Interaction are only available to residents of Canada. The bonus is valid for 30 days from the day you sign up and comes with a 3x rollover requirement. In other words, if you deposit $100 upon signing up, you'd be required to make $200 in wagers ($100 deposit plus $10 bonus times 10) before you could withdraw funds from your account. This offer may change during certain promotional periods such as Super Bowl, March Madness, or NFL Launch. Watch for banners advertising their current promotional offers on the SportsInteraction homepage. The deposit process at Sports Interaction is pain free and relatively quick to complete. Options for topping up your account include credit cards such as MasterCard and Visa, Neteller, Skrill/Moneybookers, UseMyFunds, Paysafecard and Ecocard. If you decide to deal with Sports Interaction as your sportsbook of choice, then it's a good idea to interact with their customer service representatives on a regular basis, because they base their reload bonuses on the type of customer you prove to be. When it comes time to reload your account with Sports Interaction, if you have a solid relationship with Sports Interaction, it's likely that you will receive a more significant reload bonus, often as much as 10 percent up to a maximum of $100. They also tend to offer seasonal reload bonuses around the time of major sporting events. Offering some of the finest poker action on the internet, the Sports Interaction poker room likes to give its first-time players a kick start when they originally arrive at the table. They offer a 100 percent new player bonus that starts at $20, with a $600 maximum on your initial wager. Simply use the code SIGNUP100 on your first deposit or transfer to the poker room. The amount of further bonuses are determined by player points earned during participation in poker games and tournaments. Points are awarded to players for each hand in which they contribute money to the pot, as long as the hand is raked. For every $1 a player rakes, that player will be awarded 20 points. The higher your level in Sports Interaction's VIP program, the more points you will receive. Billed as the No. 1 online sportsbook for Canadian bettors, Sports Interaction offers a wide array of sports betting options. Their selection of sports spans the globe from the staples like the NHL, NFL, NBA and MLB, to Aussie Rules foobtall, cricket, darts, Gaelic games, even greyhound racing. Naturally, as a Canadian entity, the CFL is also prominent and live betting options are also prevalent. The first licenced online sportsbook in North America, the Quebec-based Sports Interaction is operated by gaming industry veterans. Their site is safe and secure and their customer service is second to none in their knowledge and accessibility. Sports Interaction offers a 100 percent matching bonus when you sign up at their casino. All you need to do is pick a game to play and deposit in-game using the promo code FIRST100. The maximum bonus you may receive as part of Sports Interaction's 10 percent sign up bonus offer is $100. To be eligible for Sports Interaction's 10 percent sign up bonus, you must put at least $20 into your sportsbook account on your first deposit. The rollover requirement on Sports Interaction's 10 per cent sign up bonus is 3x. Sports Interaction offers numerous promotional activities throughout the sporting calendar, and they are generally connected to a major sports event such as the World Series, Super Bowl, Stanley Cup final or international soccer tournaments like the World Cup. Ongoing promotions are also featured like their weekly NFL Pick'em contest. If you want to keep abreast of what's being offered at Sports Interaction, simply sign up for their newsletter or follow them on social media and all of the up date to information will be delivered to your doorstep. No need to search for the best bets. With Sports Interaction, they will bring them to you. 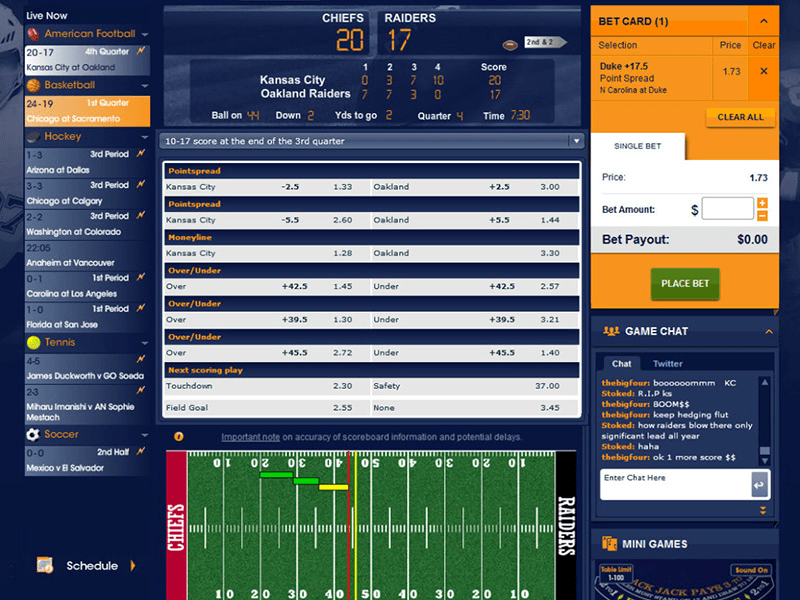 No code is required to enable Sports Interaction's sign-up bonus code for its sportsbook. To gain accees to the Sports Interaction poker sign-up bonus, simply use the code SIGNUP100 on your first deposit or transfer to the poker room. The code to access Sports Interaction 100 percent matching casino sign-up bonus is FIRST100.